The first Illinois (BB 7) was laid down Feb. 10, 1897, by the Newport News Shipbuilding & Dry Dock Co., Newport News, Va.; launched Oct. 4, 1898; and commissioned Sept. 16, 1901. In December 1907, Illinois joined the Great White Fleet for the cruise around the world. The ships visited Australia, Japan, Ceylon and other countries, returning to Hampton Roads in February 1909. President Roosevelt reviewed the fleet as it arrived, after providing the world a graphic demonstration of America's naval might. Illinois was decommissioned in Boston in August 1909. The battleship was recommissioned in November 1912 and made training cruises to Europe with midshipmen in 1913 and 1914. The ship was loaned to the State of New York in October 1921 for use by the Naval Militia. Excluded from further use as a warship by the terms of the Washington Treaty, Illinois was fitted out as a floating armory at New York Navy Yard in 1924, remaining there for more than 30 years. In January 1941, the ship was renamed Prairie State to allow its name to be assigned to a projected new battleship. During World War II, it served as a U.S. Naval Reserve Midshipmen Training School in New York. In 1956, after more than 50 years of service, the ship was transported to Baltimore and sold for dismantling. Illinois is the 13th submarine of the Virginia Class. With the other ships of the class, it represents a revolution in submarine design, construction and mission capability. This versatile and powerful vessel will maximize the contribution the U.S. submarine force makes to national security. Illinois and the Virginia Class are among the most effective platforms in the U.S. Navy portfolio. These submarines are equipped to wage multi-dimensional warfare around the globe. The central characteristic of the class is the modular construction derived from the design / build approach, which supports efficient construction and mission capability. This provides the U.S. Navy with a submarine class that advances the state-of-the-art with each succeeding ship. Illinois’ adaptability makes it highly responsive to changing mission requirements. Illinois will provide the submarine force with the capabilities required to dominate the open ocean and the littorals. In addition to anti-submarine, anti-surface ship and counter-mine warfare, Illinois will support surveillance, special operations and covert strike missions. General Dynamics Electric Boat, its construction partner Newport News Shipbuilding, and the U.S. Navy continue to collaborate on reducing the cost of future ships while introducing new capabilities to ensure the ongoing relevance of Illinois and the Virginia Class. Electric Boat’s goal remains unchanged – to provide the U.S. Navy with the most sophisticated undersea warships in the world. The ship’s crest was designed by Christopher Durdle of Roseville, Ill., in December 2014. At center, a blue shield with an orange-gold outline and detail is divided into four quadrants. The five-pointed star in the lower right quadrant commemorates the first USS Illinois (BB 7). The Roman numeral XXI represents the 21st state of the Union. In the lower left quadrant is an outline of the state of Illinois. In the upper left quadrant is a trident with crossed, single-bit axes. The trident is representative of the sea power projected by the submarine, and the crossed axes are in memoriam of President Abraham Lincoln, the “Railsplitter President.” In each corner of the crest are pinnate shapes representing the corn, beans and livestock that Illinois produces for the nation. Above the crest appears the silhouette of the starboard aspect of a Virginia-class submarine, and standing atop is a 13-point white-tailed deer. The white-tailed deer is the official state animal of Illinois and the 13 points represent the 13th Virginia-class submarine. The deer also represents the strength of the state and the Navy. Flowing to either side from the top of the shield is verdant foliage representing Illinois forest and prairie life. Framing the foliage and shield at the top are two submarine dolphins, the port side being silver and starboard side being gold; the silver dolphin for the enlisted crew and the gold dolphin for the ship’s officers. Below the shield is a red cardinal facing to starboard with outstretched wings. The cardinal is the Illinois state bird and represents the bravery of the American military. Its outstretched wings show that the Navy is prepared to take on any challenge. Beneath the cardinal is a downturned banner with the Latin words “Nemo Magis Fortiter,” meaning “none more brave,” which is a line from the fourth stanza of the Illinois state song. Surrounding the crest is a blue oval with “USS Illinois” atop and “SSN 786” below. Around the outside of the oval is a red rope commemorating the symbol of the Recruit Division Commander at Naval Training Center Great Lakes, Illinois - the Navy’s only remaining and oldest Recruit Training Command. 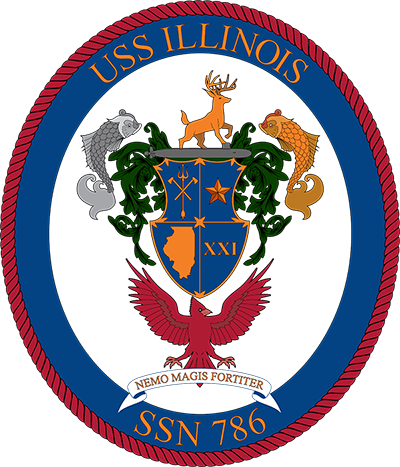 The entire crest is in the style of a family crest showing that like a family, the USS Illinois, the State of Illinois and the Navy are united and ready to serve for the good of the nation. Throughout the crest are seen the colors of Blue and Orange - the colors of the University of Illinois and the cardinal from Illinois State University representing the many fine institutions of higher education throughout the state.